LANSING — If you want to win a seat in the U.S. House in 2018, you need to raise money. Candidates running for Michigan’s 14 seats are raising heaps of it. According to new campaign finance disclosures, the state’s U.S. House candidates have already collected about $14.7 million. Three candidates have individually raised more than $1 million each. And 30 candidates have raised more than $100,000 each. The fundraising totals cover through the end of 2017. The primary election isn’t until August 2018. The early numbers indicate there could be some pricey U.S. House campaigns on the horizon in Michigan. Nationally, the cost of congressional races has been trending upward. Plus, three of Michigan’s 14 seats are open this year, which will bring competitive primary races that may not have taken place had the incumbents stayed. Then, there’s the fact that Democrats and Republicans are both targeting a handful of Michigan seats in the general election. 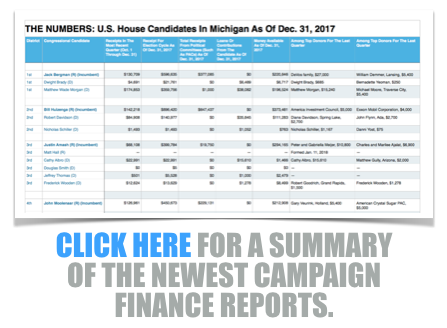 In the last campaign finance quarter, a Democratic challenger raised more money than a Republican incumbent in four Michigan districts, according to campaign finance disclosures. Money often follows competition, and as past candidates say, candidates in close races have to find ways to get their message out to voters. “A congressional district being as big and vast as it is, it’s going to take a lot of money,” said Democrat Suzanna Shkreli, who ran for Michigan’s 8th District seat in 2016. A full breakdown of the new fundraising numbers, how much money has come from political action committees and who the top donors were last quarter is available at this link. Which Races Are Attracting Big Dollars? The 11th District in Oakland County has drawn the most campaign cash of the districts in Michigan so far: $3.77 million. The seat is open because Republican Rep. David Trott, of Birmingham, decided not to seek re-election. The district could see competitive primaries on both sides of the aisle, and a competitive general election race. Four Republicans running in the 11th combined to raise $1.7 million by the end of 2017, according to campaign finance disclosures. Five Democrats running for the seat combined to raise $2.0 million. In 2016, the entire 11th District race cost only $2.5 million, according to MCFN’s tracking. Democrats didn’t heavily contest the seat, leaving it the sixth most expensive congressional race in the state that year. This time around, things could be different. There were nine candidates running in the 11th by the end of 2017 who disclosed raising more than $100,000. On the Republican side, businesswoman Lena Epstein, of Bloomfield Hills, has raised the most money at $1.34 million. Epstein was initially a candidate for the U.S. Senate but decided to run for the U.S. House instead. Three other GOP candidates in the 11th — former state Rep. Rocky Raczkowski, state Rep. Klint Kesto and Plymouth Township Supervisor Kurt Heise — crossed the $100,000 mark. Senate Majority Floor Leader Mike Kowall, of White Lake, could soon join the list. He launched his campaign committee after the reporting period closed. On the Democratic side, Haley Stevens, of Rochester Hills, has raised the most money at $655,479. Stevens was chief of staff to former President Barack Obama’s Auto Task Force. Not far behind her was businessman Suneel Gupta, of Birmingham, who has raised $503,802. Three other Democrats — former state House Minority Leader Tim Greimel, businessman Dan Haberman and Fayrouz Saad, who worked in the Obama administration — have each raised more than $150,000. 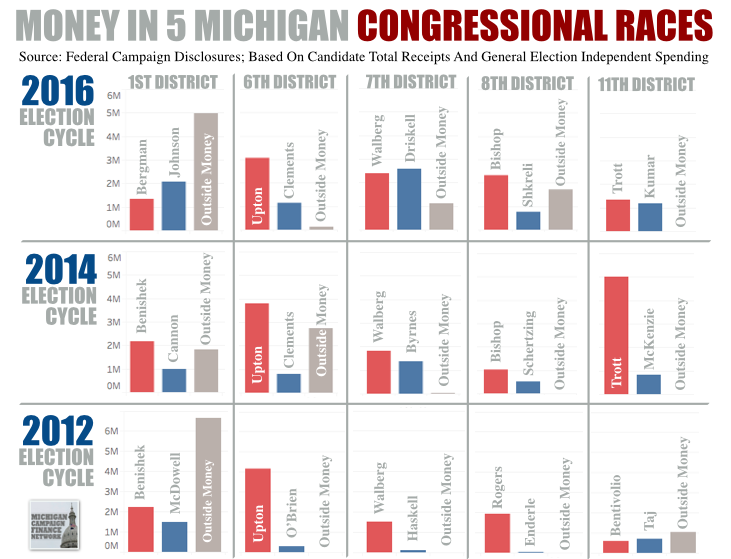 After the 11th District, Southwest Michigan’s 6th District has drawn the most campaign money at $2.34 million. There, Rep. Fred Upton, a Republican from St. Joseph, has raised $1.35 million for his re-election campaign. Four Democratic challengers have crossed the $100,000 fundraising mark with two having raised more than $300,000 each. Those two are Dr. Matt Longjohn, of Portage, who raised $330,300 and former Kellogg lobbyist George Franklin, of Glenn, who raised $326,816. The 8th District has attracted about $2.06 million so far. There, incumbent Rep. Mike Bishop, a Republican from Rochester, has raised $1.10 million. Two Democrats have been raising money to challenge him. One of them, Elissa Slotkin, of Holly, has raised $905,568. Slotkin previously worked in the Defense Department. Why Do Candidates Raise So Much Money? Past candidates for the U.S. House and campaign consultants who work for them say congressional races attract so much cash for primarily three reasons. For one of the reasons, it takes money to get a candidate’s message out. Another reason is incumbents face intense pressure to raise money to help their side win a majority and thus, control the agenda of the U.S. House. For the third, fundraising is a way for a candidate to show strength to groups that are deciding which races to invest their dollars in. Groups that work independently of candidates are becoming larger players in elections. Many of their decisions take into consideration polling numbers and the performance of the candidate. One key performance metric is a candidate’s fundraising strength. In 2016, Democrat Suzanna Shkreli, of Clarkston, challenged Bishop. The race was Michigan’s third most expensive that election cycle, attracting nearly $5 million. In an interview, Shkreli said candidates in competitive races become “fundraising machines.” Shkreli recalled spending most of her days during the campaign raising money. 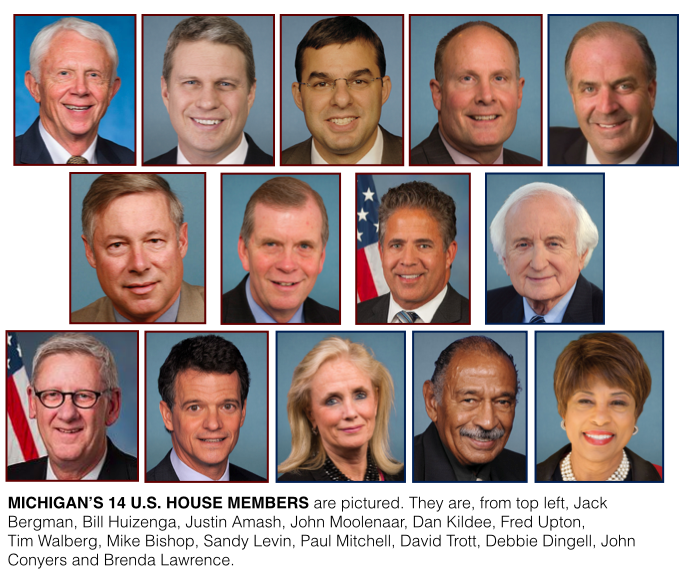 Candidates challenging incumbents have to compete with the fact that the incumbents have connections and institutional support that the newcomers may not. In Shkreli’s race, a nonprofit called American Action Network spent about $711,000 on advertisements against her. Incumbents face their own pressure to raise money. Former U.S. Rep. Joe Schwarz, of Battle Creek, served two years as a Republican in Congress before losing his seat in 2006. Many members of Congress spend three nights a week in a booth or office in Washington, D.C., making fundraising calls, Schwarz said. Congressional leadership pressures lawmakers to raise money, and fundraising performance affects committee assignments, Schwarz said.